We all know that we should tip our waitress, hair dresser, and maids (if you have one…that is). But who else should we tip? You would never consider tipping your Doctor or Lawyer would you? What about workers on your house? What about painters? Do you tip house painters? How Much Do Painters Make? According to Payscale the median hourly rate for a painter is $15.00. If a job takes a 8 hour day then that painter will makes $120 before taxes. Jobs can range in length from a day to a week depending on the size of the house. On top of paying for the actual painter, the materials, license, insurance, and experience of the person you hire all go into consideration of the price you will be charged. After seeing a job well done, and paying your large bill, it may be ridiculous to you to then give the painter a tip. And they will not be expecting it. However there are some very good reasons to tip house painters. Why Do You Tip House Painters? When we go out to eat we think nothing of tipping. Some of us may have even tried to impress someone by how much we tip. However when it comes time to tip someone who does a big job we are hesitant. But what if our painter did a good job. Not just an as expected job but they went above and beyond. They painted exactly what we asked them too, made sure the yard stayed in good condition, the windows didn’t get any dirt or paint on them, and everything looked amazing when they left. When people do their job well they should receive some sort of additional compensation for that. Another reason to tip is for the future. If in the future you need to hire that painter for another job but he has another person also wanting to hire him. He will have to choose which one will get priority. Will it be the knew customer he has never worked with? Or, the customer who not only paid on time last time but gave an additional tip to go along with the payment? How Much Do You Tip House Painters? After we have decided we are going to tip our house painters the next question is how much? A good amount is 10% to 15%. If the cost is $1000 and they do it a day early and keep everything tidy then they should be closer to the 15% ($150 in this case). However if they didn’t do that great of a job, it took longer then expected, or they have to come out and fix some things they missed I wouldn’t tip. While tipping a house painter is unnecessary, it can be good to do. Not only do insure that in the future your work is likely given priority you also show gratitude to the painter. You could also “tip” them with things like food and drink while painting. Or you could “tip” them with more work whether for you or someone you know. What’s important is that you make sure those who you hire feel appreciated so that not only are they willing to work with you again, but they are willing to send quality people to do other things for you. A great house painter knows a great floor guy, and a great cabinet guy, and anything else. They love to help out those who they work with by sending them great customers like you who tip them. 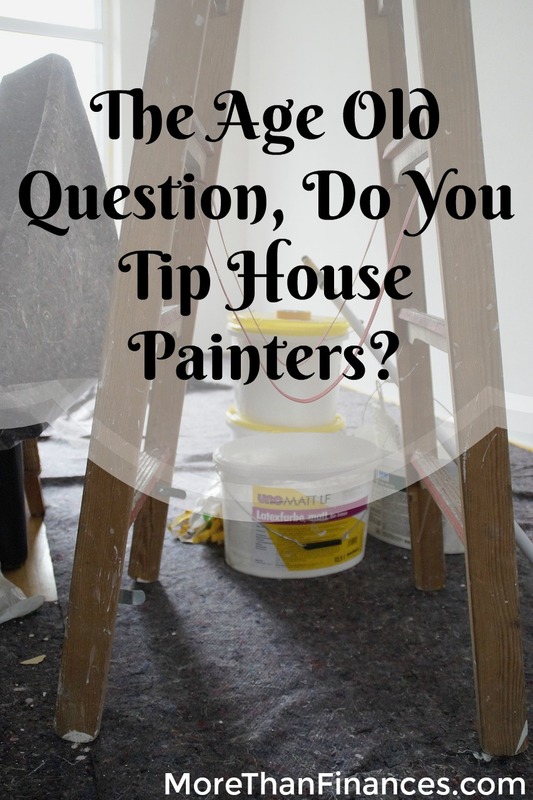 2 Responses to The Age Old Question, Do You Tip House Painters? Great post! I’ve never really thought much about tipping painters, but I can see how it would be helpful — especially if you need additional work done. It’s always great to develop healthy relationships with people, even if it doesn’t appear to have an immediate payoff. You know, TIP originally stood for To Insure Promptness and was given before your meal arrived – to motivate the waiter to keep things moving quickly. Sometimes I wonder if tipping ahead of time would be beneficial for us today. And who knows, maybe your painters would do a better job if they received a 10% tip ahead of time! Well, every worker (even not painters) tends to get motivated when they are appreciated. And one way to show appreciation is by giving TIP. Also, it is understandable to give a tip when a worker has done a great job! So if the painter has done well and have produced the finishing that you aim, I must say, giving tip can build a relationship with that person. Who knows, you might be needing his services again in the future, right?